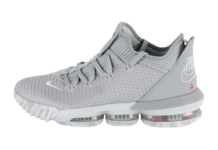 Adding to Nike’s LeBron 16 “1 Thru 5” series will be the “I Promise” iteration, which is LeBron’s personal favorite colorway, that represents the Center position. This Nike LeBron 16 is inspired by his children and the I Promise school that opened up earlier this summer in Akron, OH. The shoe features a Black Battleknit 2.0 upper with Multicolor colors on the underlay atop an outsole that represents his family. Finishing off the theme is a “WE ARE FAMILY” message on the leather heel wrap. Look for the Nike LeBron 16 “I Promise” to release on November 20th at select Nike Basketball retailers and Nike.com. The retail price tag is set at $185 USD. UPDATE: Nike will be raffling seven pairs of the LeBron 16 “I Promise” via an online drawing that begins today. All proceeds will benefit LeBron James’ I Promise School in Akron, Ohio. Each winner will receive the LeBron 16 “I Promise” shoes as well as a custom, hand-painted surfboard signed by LeBron James in celebration of his first season in Los Angeles. The drawing can be entered here. You can be submitted until Friday, November 23rd and each entry costs $10. Winners will be announced on Saturday, November 24th. UPDATE: Nike has confirmed that the “I Promise” LeBron 16 will release on November 20th for $185. UPDATE: Nike releases official photos of the “I Promise” LeBron 16 that is set to release in November.